Happy Tuesday! Did you all have a nice long weekend? I sure did - lots of catching up on things around my apartment, dinner with parents & friends, and several homemade lemon-drop martinis - yum! Anyway, on with today's post, which I've been looking forward to sharing with you for weeks! 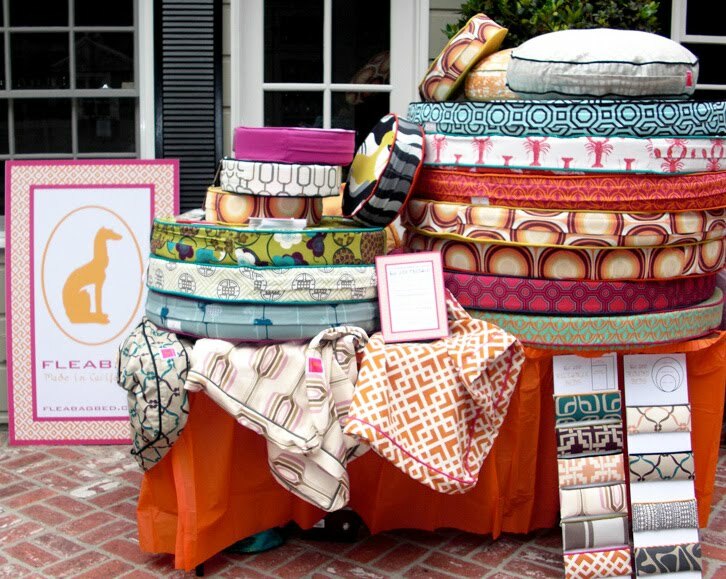 I'm excited to introduce the hot new company Fleabag Bed, recently launched by longtime colleague and friend, Sabina Vavra, and her business partner, Chelsea Hernandez. 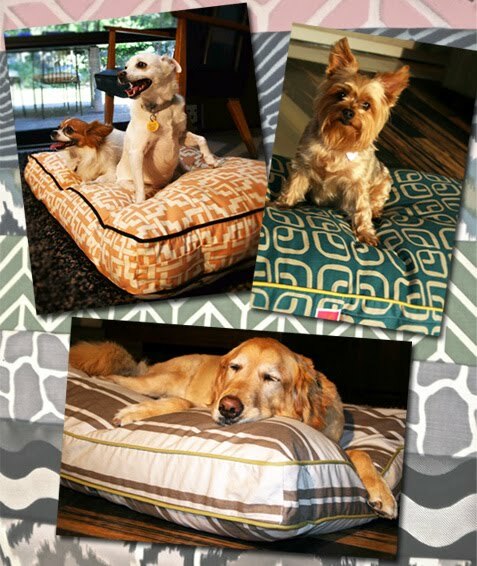 These talented and driven California-based interior designers came together to create a fabulous line of "edgy and affordable" dog beds after Sabina noticed a void in the marketplace for such a thing. For any of you who have a dog or cat, you've probably noticed the selection out there is pretty limited to overpriced, neutral (boring!) and cutesy pet beds. That's until the fabulous new line of Fleabag Beds was born. The latest collection features an infusion of graphic patterns in turquoises, tangerines, and saffron's. Available in (3) different round sizes and (2) rectangular sizes; all are washable, poly-filled + reversible. Now for the fun part: Sabina and Chelsea have offered belle maison readers a chance to win a $75 Gift Certificate to their shop! 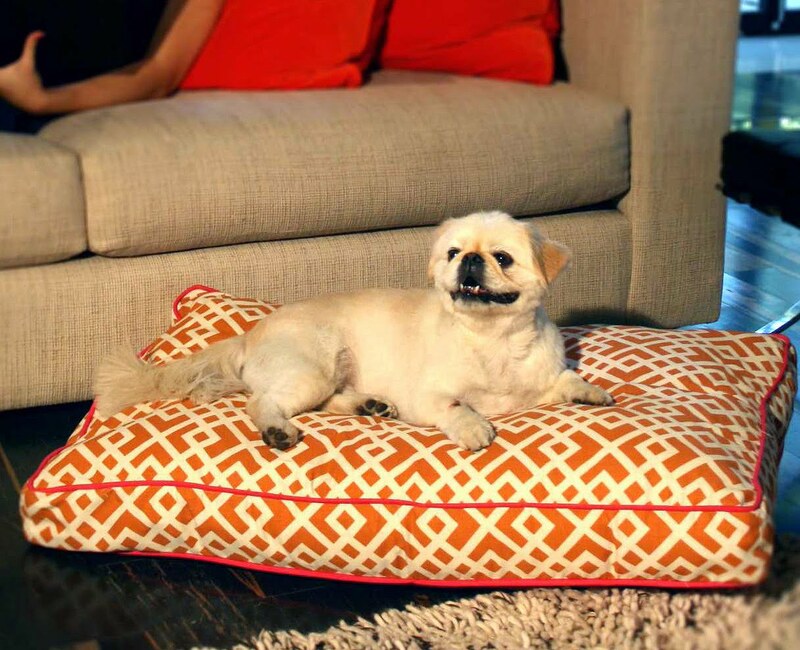 If Fluffy or Fido are in need of a new bed, now's your chance to give them one you'll both love. My kitty Jada, enjoying her very own Fleabag Bed - she loves it! These are so neat! The Star bed would match the decor in my living room, though I think the Tokyo fits my little ladies personalities better :) Maybe I'd just get both! ah I need to buy a fleabag first. very stylish! Love these beds! I love the pinch me bag - so cute! Love these! While the Meerkat is precious, Ralph is a bit too large so I'd be going with a large sized LEXI!! i would like one for me in my office at work. Lovin the Fido, would look great in my redone master bed room! They are all so cute, but I definitely prefer the classic look of the Duke Fleabag for our home. "Fido" would be the perfect gift for my grandpa and his little doxin, Henry. What a beautiful design! I have three chihuahuas and I can see them all lounging on the large 'Star' pillow quite handsomely! I want this so badly! I just moved into a new apartment and need a new bed for my Chiweenie. I love that the designs are fun and would love to keep one in my living room for my pup. Would Love the Tokyo-Small! These are *oh* so cute! For my golden retriever mix, Carat, definitely Bella, large-round!! These are wonderfully adorable. Posting on facebook right away! Our dogs are in desperate need of a new bed. The Lexi would look great in our bedroom! I would definitely get the Bingo for my dog Toby-- I love it!! What a wonderful post on us and Fkeabag Bed, we hope everyones dogs n cats loves them as much as ours do, thanks for sharing! my ridgeback hunter wants the duke bed. he lives in the country and prefers a neutral palate. he said the bed looks very comfortable and he would love one! I would go with the 'pinch me - large'! My pup would love it! I've wanted a dog bed for my cocker spaniel, Lula, but could never find anything cute that actually matched my house! I love love love the Viceroy - it would look great in my place! OMG! I love, love, love these! I would definitely pick the Lexi for Penny.... she would enjoy her old days in stylish slumber:) So cute! Finally, a way for my dog to be stylin'! His dog bed is the most boring thing ever. 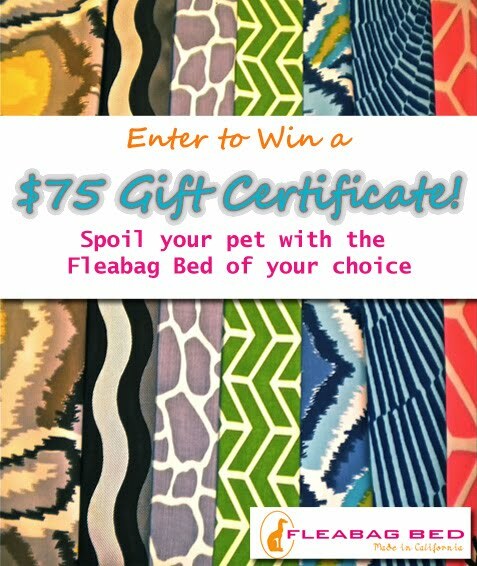 I love the Fido print, and would just be thrilled to pieces if I won! Our dog, Lucky, would be soooo lucky to have a large Duke Fleabag bed! 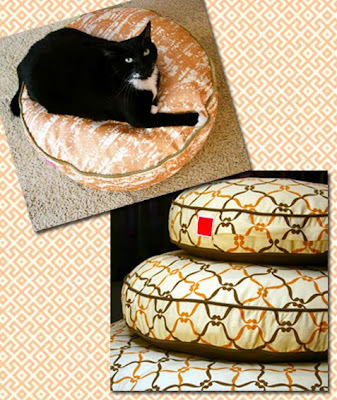 What adorable dog beds! Finally something cute - I love all of the choices! My fave for my little fleabag is the Bingo pattern. Thanks for the chance for this generous giveaway! Loving the coral and white lobster one!! Perfect for a little jack Russell I know!! Thanks for offering the giveaway!! I love the Hayze Dayz bed! So pretty! I'd definitely spend the gift certificate on the "Bingo" bed- I love the orange fabric! no question that i would love to treat my pup Ruby to a large STAR round bed! I like the MeerKat, but it is only available in small, and my pupper is probably too large to squeeze her bum on there. But the color and pattern are right up my alley! I could always buy it for a friend. OMG! i've been lookin' everywhere for a stylish doggie bed and you answered my prayers!!! the colors and the patterns are too die for! thanks so much for this! I love Lexi and Fido and I'd spend my gift certificate on a large one but it would be hard to pick which one, so I might just have to get both!!!! Oh... I love Bingo! It's fun. These are awesome! Love the Bingo one! These are so fabulous! Love their fabric combinations. My little yorkie would look adorable on the Lexi. Or Bingo. I love the colors of the Pasadena one! I would have a hard time deciding between "Chloe" and "Fido." My four kitties would have to share! Any of these would look great in a well decorated home. I am crazy for the BINGO and the CHLOE!!! Please count me in for this wonderful giveaway!! B-I-N-G-O. Only the orange-y best for my golden retriever Ray. It's chic, modern and would look fabulous in my living room! Our beautiful 18 year old mixed breed Annie, whom we now carry up and down stairs (etc.!!) and still love so much would be a happy lady in a large round FIDO. * Would LOVE the ORANGE/TANGERINE bed w/ HOT PINK PIPING for our wonderful "BELLE=GIRL"... Annnnd, MUST admit, I would SO ENJOY seeing my sweet hubby's reaction to "HIS HUNTIN' DAWG" lounging on that wonderfully colored, "GIRLY-BED"!!! I Like the Atlas it looks and sounds so manly! I would get a small bed for my Daddy's little friend. They would both love it. they are all so cute but i like star's yellow piping against the grey! I personally love the Bingo design but Moochie would probably prefer the Fido which I also love! I would get the Small Star fleabag for my lil' kitten! Soooo cute! Love the BINGO and the PInch me!! Also love the fact that they are reversible! I have 3 dogs so I need 3 cute beds!! Can't wait to start shopping! These are delightful! Really a style sensitive alternative to the Orvis Plaids! I have a large tricolor collie and I think "Presley" would adore and look so handsome resting on the large DUKE bed... fit for the "King". Oh my GOODNESS! Little Lou-Bean would look absolutely dashing on the Viceroy. Bonus points that is matches the steel-y gray and blue look that I already have going on! When I first saw the picture, I didn't even realize they were doggy beds! They're so fashionable, I thought they were decorative pillows for every day use! My favorite are the round shaped ones, they would be perfect as a seat cushion for my computer chair, a throw pillow for the floor when I have friends over, or even as a comfy pillow for my head. My favorite pattern is the Laguna Beach pink one! These are too cute for words! I especially love the Lexi bed!! I like the fido design - I think. It is hard to pick just one! Oh how fun!! I live at the beach so obviously Pinch Me bed needs to find a home here for my two pups! They are all fantastic! My goldens would love a fido fleabag! Love the Fido or Lexi beds! what a great idea! my italian greyhound loves snuggling on anything soft and I am actually shopping around for her first "big girl" bed since she recently out grew her puppy bed! I love the medium Bingo bed...she could really stretch out! Those are so precious!! My puppy, Sophie, would adore the "lexi" bed!! Loving the color!! Bingo! Bingo! I've got (to have) it! My Irish Pied (black and white) Havanese, Parker, would love it and look smashing on it!